It could be argued that upland hunting is the most active of the fieldsports, with bird hunters covering miles and miles in hopes of a flush. That kind of walking—and in many cases climbing—takes a toll on feet, especially those clad in cheap or uncomfortable footwear. 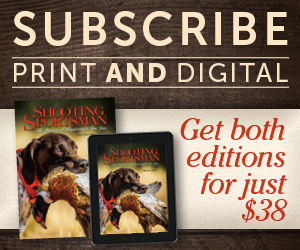 After a fine shotgun and steady dog, a good pair of boots might be the wingshooter’s most important investment. There are literally hundreds of different boots on the market, many marketed specifically to upland hunters. This past spring I asked several bootmakers to send me their latest, greatest models for upland hunting. 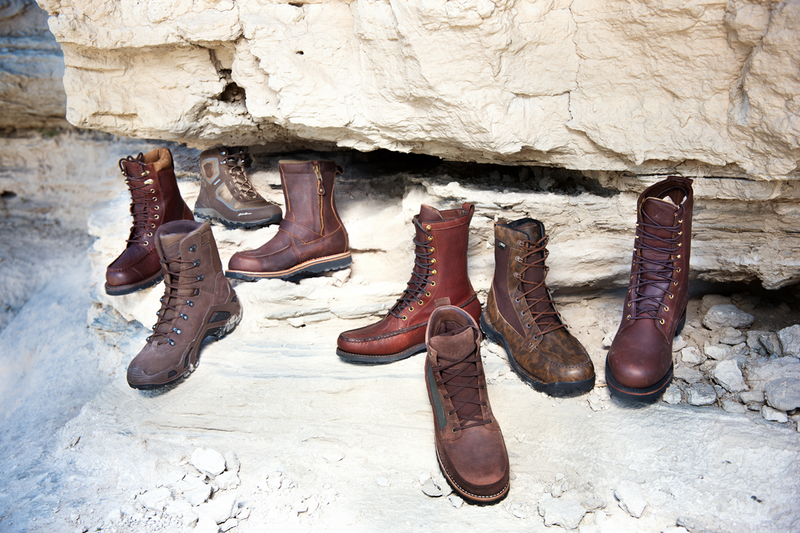 As you can see, the definition of what makes a bird hunting boot is up to interpretation, but each model went through the same test: a short break-in period on morning walks followed by intense hikes in rain, snow, mud and warm weather—in other words similar conditions to what hunters might encounter throughout a season. Here is a hard look at eight of the best performers. ▲ With a style right out of Africa, Cabela’s Chukkas would feel more appropriate walking up francolin in the bush than kicking up roosters on the prairie. Still, they’re a worthy choice for hunters who like this cut of boot with a lower top and boxy toe. Green fabric panels contribute to the Field Chukka’s light weight and allow the foot to breathe. Truth be told, the heavy-gauge nylon probably will outlast the rest of the full-grain leather uppers, which are a bit lightweight in my estimation. The soft leather makes them very comfortable, however, with just the right amount of flex during the step. It also minimizes break-in time to nearly zero. Inside, a membrane of Cabela’s Dry-Plus keeps moisture at bay, though I wouldn’t trust it to keep feet dry during repeated creek crossings. The rest of the boots are as classic as their looks, with traditional stitch-down leather welts, flexible midsoles and waffle Vibram outsoles. Removable poly/foam footbeds help cushion the foot during longer treks, and collars and tongues are fully padded for greater comfort. 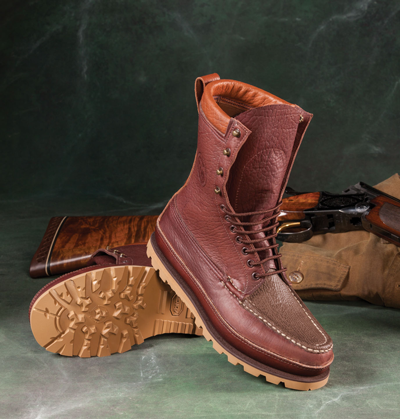 Combined with the traditional appearance, the Sixty-One Series (named for the year of Cabela’s founding) has a fit and feel that results in footwear that’s ready to be worn in both town and country. Height: 7.5”; weight: 2.4 pounds. Price: $140. Cabela’s, 800-237-4444; cabelas.com. ▲ These new updates of Danner’s Sharptails are sure to find a home among bird hunters who loved the original versions for their foot-cushioning comfort and long-wearing durability. They also have shelf appeal with uppers built from tough full-grain leather that’s mottled to an almost camo look. Necessary? No, but admittedly they do look kinda cool. The uppers also get fitted with 900-denier nylon panels that reduce the boots’ overall weight and aid in breathability. Elements, including rain, snow and heavy dew, are sealed out via full Gore-Tex booties. The Sharptails are built on an athletic last that feels true to size, and wraps the feet tightly with a snug heel cup. They break-in fairly quickly, but I wouldn’t put on a ton of miles right out of the box. Better to wear them around the house or office for a few days before a long jaunt in the Sandhills behind a big-running pointer. Cushioned orthotic footbeds and Danner’s exclusive Terra Force platform aid in both comfort and protection. The outsoles are fairly shallow and they shed mud and dirt quickly, but they feature an aggressive chevron-type pattern with moderate grip on slick or wet surfaces. Combination Goodyear welt and cemented construction is likely a nod toward keeping the Sharptails affordable, though it does reduce weight slightly and improve flexibility at the arch. Height: 8”; Weight: 3.2 lbs. $190. Danner, 877-432-6637; danner.com. ▲ Hunters who prefer a speedy hiker over a dedicated upland boot will find a lot to like about these boots from Eddie Bauer’s Sport Shop line. Lightweight nylon uppers with poly-tape accents are wrapped with tough Helcore leather. (Helcore is a special, micro-thin treatment that greatly increases the material’s durability and resistance to abrasion or damage.) The uppers also are backed by Bauer’s proprietary WeatherEdge membrane, which is fully waterproof yet still moderately breathable. On the downside, the 100-gram insulation feels a bit out of place for the conditions a hiker of this style is generally built for. The added protection does add another month of use to the Field Ops boots, making them appropriate well into the middle of bird season. The uppers wrap solidly around the instep with a little extra room in the toe box. The heel cups feel solid, and I experienced no slippage during the testing process. Standard eyelets have been replaced by fabric tape, which increases the boots’ slim profile but does leave some question about longevity, as I’d expect the fabric to abrade in heavy cover. Moderately aggressive Vibram outsoles kept me upright in wet, steep climbs, though you can expect them to pick up a little mud. Height: 7.5”; weight: 2.2 pounds. Price: $200. Eddie Bauer, 800-426-8020; eddiebauer.com. ▲ Filson’s moccasin-toe Uplander Boots are so new that models weren’t available for testing, but the company did send a pair of its Highlanders. The classic logger style would be right at home in the thick grouse woods, exhibiting the legendary manufacturer’s long history of outfitting woodsmen and timber cruisers, with tall, 9” uppers made in the US of full-grain, oil-tanned leather. Sandwiched between the uppers and interior leather linings is a layer of heavyweight, 24-ounce Mackinaw wool. All of that insulation makes the boots a bit much for early season hunting. Later in the year when the snow is deep and temperatures fall below freezing, Highlanders might be the perfect choice. The full leather tongue is gusseted with Filson’s Tin Cloth, which wraps the ankle better than leather without compromising waterproofness. The heavy leather does take some break-in time, so don’t plan to pull these from the box on opening day and not end up with a few blisters or chafing around the ankle and instep. Casual wear before the opener also will help the cork midsoles form to your feet for a custom-like fit and shock-absorption. 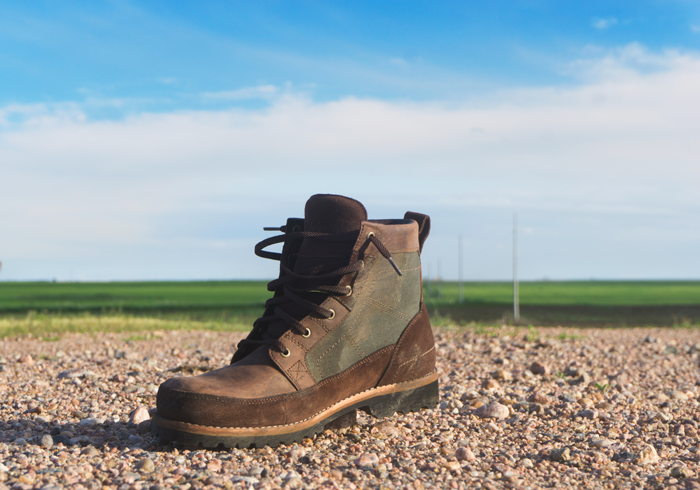 Once worn in, these boots are extremely comfortable, even on long days. The logger design features a taller heel, something that does take getting used to, but for traversing uneven terrain typical of dense woods, these boots provide a positive grip. Height: 9”; weight: 5 pounds. Price: $420. C.C. Filson, 800-624-0201; filson.com. ▲ Maybe it’s because I’m lazy or a little impatient, but I’ve always leaned toward slip-ons in all types of footwear. These tall, 9” boots forgo laces for a solid, brass YKK zipper that runs up the inside of the ankle and calf. This allows for a quick slip, zip and go when the roosters are crowing at sunup. Of course, slip-on construction does sacrifice some of the foot-gripping ability of lace-to-toe boots. Leather straps across the insteps with brass buckles help cinch things tighter, but I wouldn’t want to bury these boots in sucking marsh mud for fear of losing them in the muck. The full-grain leather uppers are fairly flexible from the get-go, but I noticed they do scuff easily. I don’t buy hunting boots for looks, so that’s not an issue. 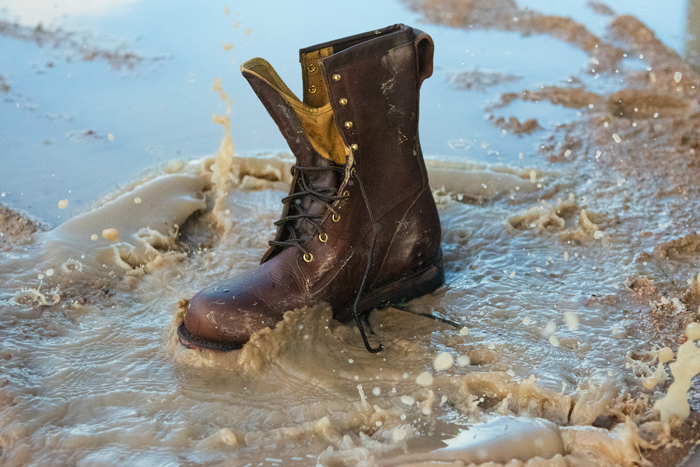 Moisture-wicking linings cover Irish Setter’s proprietary waterproof Ultra-Dry construction, which helps maintain a dry foot from the inside out. Footbeds are made from memory foam to cushion feet, and polyurethane heel counters help prevent slipping. Underneath it all lies the company’s Prairie rubber outsoles, with fairly shallow groove-and-dot tread providing surprisingly more traction than you might expect. Weight: 3.9 pounds. Price: $195. Irish Setter, 888-738-8370; irishsetterboots.com. ▲ These are the boots your grandfather wore, but that doesn’t mean they’re old-fashioned. Call them classics, with a stitched moccasin toe and shallow tread that’s made to put on miles. Built on a narrower last, the kangaroo-leather uppers wrap around the instep and forefoot for a solid grip that starts a bit tight but loosens as the leather forms to the feet. Though the uppers are narrow, fiberglass shanks and stitch-down welts create fairly wide and stable platforms for walking. The Goodyear construction also means that these boots can be re-soled, as the outsoles may wear out long before the tough leather uppers call it quits. Speaking of outsoles, these boots get the Vibram Gumlite treatment, meaning they’re extremely flexible throughout the stepping motion. The Gore-Tex lining can take a full dunking and still keep toes dry. Brass eyelets lace up to the ankle, where two pairs of hooks cinch the padded leather collars tight. Though heavy-duty, the hooks are a bit tight, and it takes a strong yank to pop the laces into place—not a major issue but worth noting. 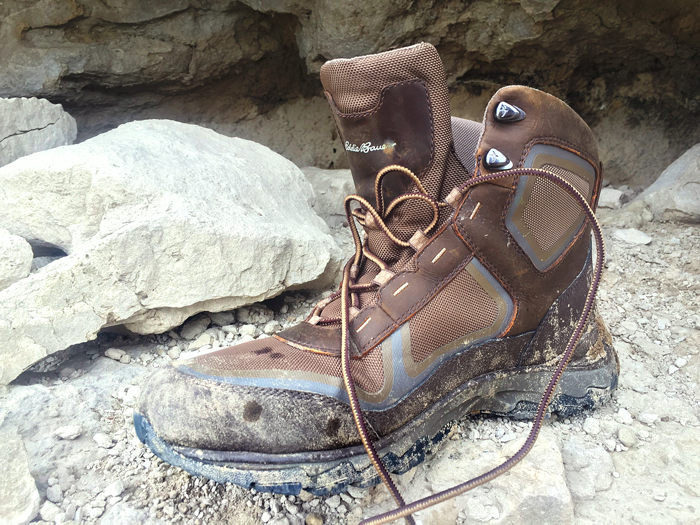 At a little more than 3 pounds 7 ounces, these were among the lightest boots in the test. Height: 9”. Price: $190. L.L. Bean, 800-441-5713; llbean.com. ▲ Today’s standard, off-the-shelf footwear is arguably of better quality and construction than it has been at any point in history. Certainly the number of options available is greater than ever. But even with all of the choices, the case could be made that custom boots are best for the serious bird hunter. 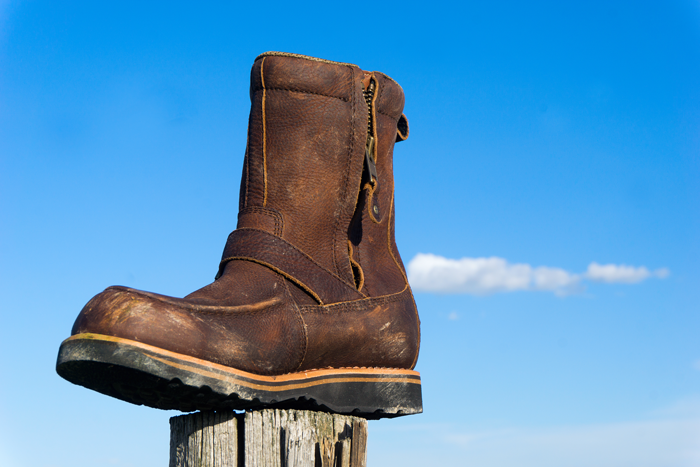 Bespoke boots will not only fit better but also likely last longer than standard footwear. These days cobblers are few and far between, but there remain a few custom bootmakers, the most well known of which is probably Russell Moccasin Company of Berlin, Wisconsin. For nearly 120 years the company has been handcrafting shoes and boots of all kinds, with a special focus on footwear for hunters. From its traditional Bird Shooters to African-inspired Safari Chukkas, each boot is built by hand to specs provided by the customer. By using a proven fit system that measures the foot and leg at several points, Russell’s bootmakers can make the perfect boot for each hunter’s size and style of hunting. A bespoke pair of Russells doesn’t stop with the right fit. Customers also can select from a variety of leathers, from bullhide to buffalo and even exotics like ostrich. Providing one’s own leather from harvested game animals is also an option, as are a host of other smaller, though-no-less-important details. Of course, all of this comes with a price. All told, custom boots could be considered expensive—but like all great investments, they often return their original cost in spades. Russell Moccasin Co., 920-361-2252; russellmoccasin.com. ▲ To be successful on wild chukars, hunters need to climb. 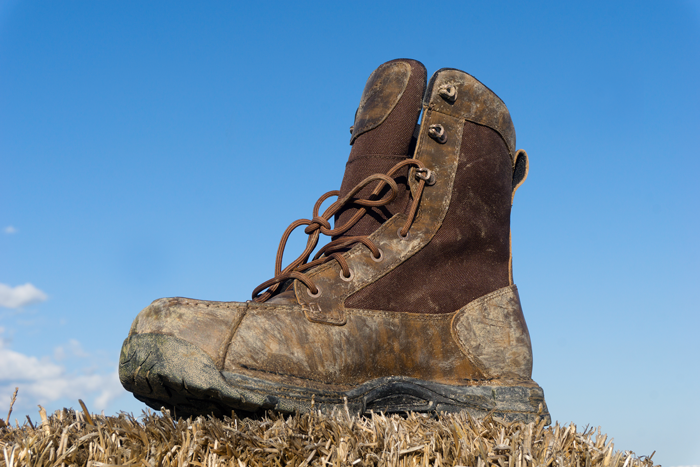 That requires boots built for the mountains, such as those made by Lowa. 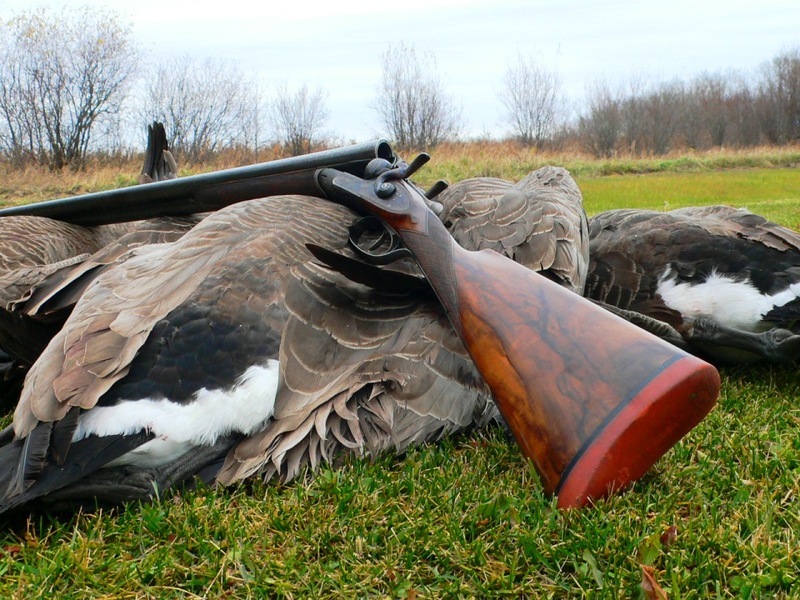 These hybrids are also a great choice for multi-species hunters who chase birds and big game in the fall. Light in weight for all-day trekking, they feature tall, semi-rigid uppers to support the feet and protect ankles from rolling in rough terrain and loose scree. Don’t get fooled by the mountain-boot family tree—the Z-8s are surprisingly comfortable and flexible right out of the box, requiring less break-in time than some of the other boots in the test. The uppers are built of tough split leather with heavy-duty nylon on the backs of the ankles. A Gore-Tex lining seals out rain and moisture, and a patented Climate Control system pumps heat and sweat out of the boot with every step. Polyurethane toe bumpers and a full-wrap midsole with gripping heel cup further protect the boots—and the wearer’s feet—from wear and injury. 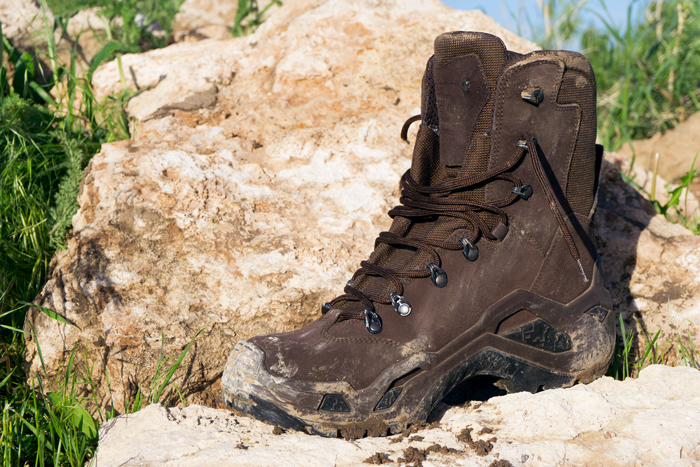 These boots are built for all but the most vertical of terrain, with rubber outsoles that are fairly aggressive with a mid-depth tread that does a decent job of shedding mud. The lacing system forgoes open hooks, replacing them with closed eyes all the way to the top. This helps cinch the boots tighter around the feet and ankles but does make slipping them on a little more difficult for those of us with higher insteps. Height: 8”; weight: 3.1 pounds. Price: $325. Lowa, 877-307-7277; lowaboots.com. ▲ It’s rare to find a true moccasin-cut boot; most modern models feature only the boxed toe of a moccasin. These boots are the real deal, which is befitting the 166-year history of the Gokey leather shop (now owned by Orvis). This style of boot wraps more fully around the entire foot, creating, after five or six wearings, a fit that’s as close to custom as you can get with an off-the-shelf boot. These are handcrafted of 9-ounce pebbled bullhide, which has been oil-tanned to give the appearance of a broken-in ball glove right out of the box. 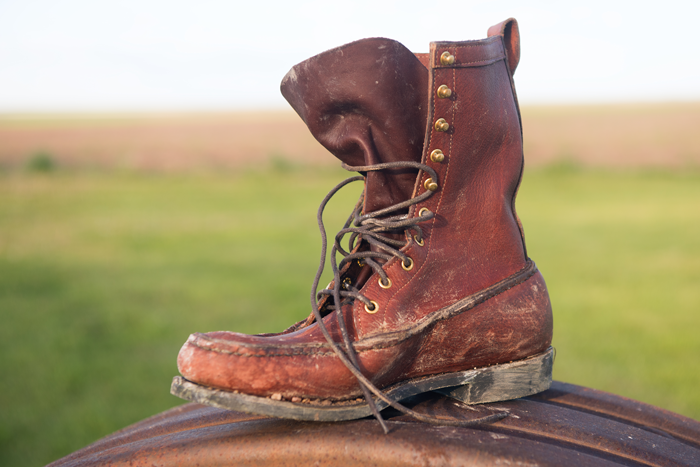 The rugged leather does take a bit of time to soften up but wears like iron. The uppers are hand-stitched to the Vibram outsoles using waxed thread and locked down at each stitch for maximum protection. 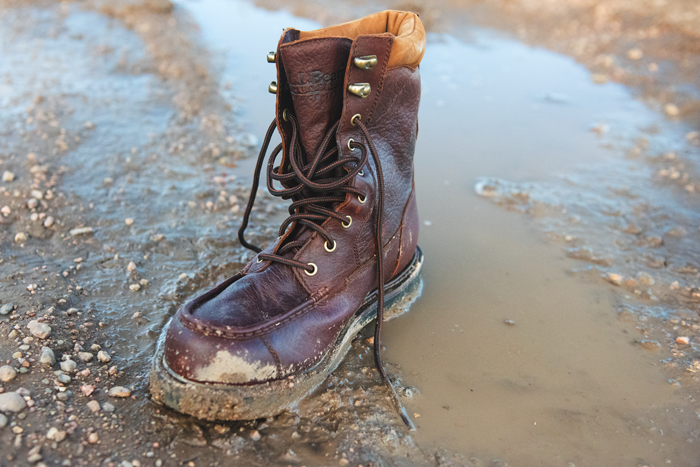 A true throwback, the Gokey Classic even forgoes Gore-Tex, relying instead on construction and natural waterproofing of the leather to discourage, though not always prevent, wet feet. Eyelets across the instep with four pairs of brass hooks up the shaft speed the on/off process. My biggest complaint is the excess of leather that makes up the gusseted tongues, which need to be tucked around the ankle to prevent binding and chafing. Otherwise, these might be the perfect boots for bird hunters with an eye toward tradition (and a wallet to support the habit). Height: 10”; weight: 3.6 pounds. Price: $395. Orvis, 888-235-9763; orvis.com. David Draper is Shooting Sportsman’s Field Gear Editor.